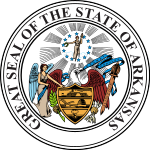 The 2014 Arkansas gubernatorial election was held on November 4, 2014, to elect the Governor of Arkansas, concurrently with the election to Arkansas's Class II U.S. Senate seat, as well as other elections to the United States Senate in other states and elections to the United States House of Representatives and various state and local elections. Incumbent Democratic Governor Mike Beebe was ineligible to run for re-election due to term limits established by the Arkansas Constitution. Arkansas is one of eight states that limits its Governors to two terms for life. The Democrats nominated former U.S. Representative Mike Ross and the Republicans nominated former DEA Administrator, former U.S. Representative and 2006 nominee Asa Hutchinson. Hutchinson defeated Ross and two minor party candidates in the general election. ^ a b c Demillo, Andrew (December 5, 2011). "Coleman mulling 2014 bid for Ark. governor". RealClearPolitics. Archived from the original on January 8, 2012. Retrieved December 6, 2011. ^ "Election filings include Democratic gubernatorial candidate". Ark Times. 28 February 2013. Retrieved 5 March 2013. ^ "Mike Ross for governor: Rumours mount". Ark Times. 22 February 2013. Retrieved 26 February 2013. ^ "Bill Halter Withdraws from Governor's Race". 29 July 2013. Archived from the original on 29 July 2013. Retrieved 29 July 2013. ^ "Attorney General Dustin McDaniel dropping out of 2014 governor race". Archived from the original on September 26, 2013. Retrieved January 25, 2013. ^ a b c d e f Lyon, John (January 27, 2013). "McDaniel's Departure Leaves Arkansas Governor's Race Wide Open". The Times Record. Retrieved June 15, 2013. ^ "Twitter / TolbertReport: By the way Shane Broadway tells". Twitter.com. Retrieved 2013-09-22. ^ a b "Sources: John Burkhalter to Run for Lt. Governor". Fox16.com. June 11, 2013. Retrieved June 15, 2013. ^ a b Brantley, Max (January 30, 2013). "McDaniel's farewell". Arkansas Times. Retrieved February 26, 2013. ^ a b Henry, Larry (December 27, 2012). "UA Chancellor Gearhart: I'm Not Running For Governor". KFSM-TV. Retrieved December 29, 2012. ^ "Mark Pryor attracts opponents for the 2014 Senate race | OUR VOICES: ARKANSAS". Our-voices-arkansas.com. Retrieved 2013-09-22. ^ "Arkansas Governor April Rundown". Natural State Report. April 4, 2013. Retrieved June 15, 2013. ^ "Twitter / bmaloch: RT @MikeRossUpdates: Thanks". Twitter.com. Retrieved 2013-09-22. ^ "Mike Malone, Executive Director". Retrieved February 5, 2013. ^ "New Names Surface in Governor's Race". Retrieved February 5, 2013. ^ Miller, Joshua (March 6, 2013). "Farm Team: Arkansas Has Deep Bench but Few Opportunities". Roll Call. Retrieved August 9, 2013. ^ Saylor, Ryan (February 13, 2013). "Paragould attorney mulls run for Attorney General". The City Wire. Retrieved August 9, 2013. ^ "Cook: Bill Clinton To Headline Mike Ross Fundraiser". Talk Business Arkansas. April 6, 2014. Retrieved April 8, 2014. ^ a b c d e f g h i j k l m n o p q r s t u v w x y z aa ab ac ad ae af ag ah ai aj ak al am an ao ap aq ar as "Complete List of Endorsements". Mike Ross. Archived from the original on 2013-09-25. Retrieved 2013-09-22. ^ "Gov. Beebe endorses Mike Ross for Governor". The City Wire. Fort Smith, Arkansas. August 17, 2013. Retrieved 2013-10-19. ^ Brantley, Max (July 29, 2013). "Bill Halter withdraws from Arkansas governor's race". Arkansas Times. Retrieved August 2, 2013. ^ a b "2014 Arkansas Preferential Primary Elections and Nonpartisan Election May 20, 2014". Arkansas Secretary of State. Retrieved June 4, 2014. ^ "Asa Hutchinson will run for governor in 2014". Retrieved January 25, 2013. ^ Moritz, Rob (February 12, 2014). "Republican candidate switches to lieutenant governor's race". Arkansas News. Retrieved February 13, 2014. ^ Brantley, Max (January 10, 2013). "House Speaker Davy Carter leaving bank job UPDATE". Arkansas Times. Retrieved January 14, 2013. ^ Glueck, Katie (August 1, 2013). "Arkansas's Tom Cotton to run for U.S. Senate". Politico. Retrieved August 2, 2013. ^ Daniels, Alex; Frago, Charlie (November 12, 2012). "Democrat Mark Pryor seen as likely GOP target in '14". Arkansas Democrat-Gazette. Retrieved December 29, 2012. ^ "Darr: Will not run for governor in 2014". Arkansas News. 2013-02-12. Retrieved 2013-09-22. ^ Brock, Roby (December 2, 2012). "Griffin Wins Seat On Ways And Means Committee, Will Not Seek Higher Office In 2014". Talk Business. Retrieved December 29, 2012. ^ Brantley, Max (December 19, 2012). "Who will leads us in 2014?". Arkansas Times. Retrieved December 29, 2012. ^ "Governor's race shift". The City Wire. 15 May 2012. Retrieved 31 July 2012. ^ "GOP Sen. Johnny Key won't seek governor's post". Arkansas Online. 23 April 2013. Retrieved 24 April 2013. ^ a b Brock, Roby (February 12, 2013). "Sheffield Nelson Weighing Governor's Run As Republican Or Independent". Talk Business Arkansas. Retrieved February 26, 2013. ^ Tilley, Michael (14 March 2013). "Womack not running for governor, open to Senate bid". The City Wire. Retrieved 3 April 2013. ^ Moore, Martha T. (April 25, 2013). "Ron Paul makes Broun, Sanford first Congress Picks". USA Today. Retrieved August 12, 2013. ^ "Ron Paul Endorses Curtis Coleman for Governor of Arkansas | Peace . Gold . Liberty". Dailypaul.com. Archived from the original on 2013-09-26. Retrieved 2013-09-22. ^ "Curtis Coleman Receives Legislative Endorsement from Rep. Randy Alexander | Coleman For Arkansas". Curtiscoleman.com. 2013-06-18. Archived from the original on 2013-09-26. Retrieved 2013-09-22. ^ "State Representative Farrer Stands With Curtis Coleman | Coleman For Arkansas". Curtiscoleman.com. Archived from the original on 2013-09-26. Retrieved 2013-09-22. ^ "Representative John Payton Endorses Curtis Coleman". Coleman For Arkansas. Archived from the original on 27 September 2013. Retrieved 24 September 2013. ^ Brantley, Max (July 18, 2013). "The Republican fringe". Arkansas Times. Retrieved August 2, 2013. ^ "Coleman Receives County Judge Endorsement | Coleman For Arkansas". Curtiscoleman.com. 2013-04-23. Archived from the original on 2013-09-26. Retrieved 2013-09-22. ^ "Baxter County Assessor Endorses Coleman For Governor | Coleman For Arkansas". Curtiscoleman.com. 2013-04-23. Archived from the original on 2013-09-26. Retrieved 2013-09-22. ^ "Texarkana Mayor Wayne Smith Announces Gubernatorial Endorsement | Coleman For Arkansas". Curtiscoleman.com. 2013-04-16. Archived from the original on 2013-09-26. Retrieved 2013-09-22. ^ "Garland County Treasurer Endorses Coleman for Governor | Coleman For Arkansas". Curtiscoleman.com. 2013-06-26. Archived from the original on 2013-09-26. Retrieved 2013-09-22. ^ "Miller County Patriots Endorse Coleman for Governor". Coleman For Arkansas. Archived from the original on 27 September 2013. Retrieved 24 September 2013. ^ "Bishop Robert E. Smith, Sr., Endorses Curtis Coleman For Governor | Coleman For Arkansas". Curtiscoleman.com. 2013-04-04. Archived from the original on 2013-09-26. Retrieved 2013-09-22. ^ "Coleman Receives Major Education Endorsement | Coleman For Arkansas". Curtiscoleman.com. 2013-07-17. Archived from the original on 2013-09-26. Retrieved 2013-09-22. ^ a b c d e f g h i j k l m n "Asa for Governor – Home Page". Archived from the original on August 3, 2013. ^ "Senator Alan Clark Endorses Asa Hutchinson". Asa for Governor. Archived from the original on 2013-09-25. Retrieved 2013-09-22. ^ "Longtime Democrat Senator, Pine Bluff Mayor, Endorses Asa Hutchinson for Governor". Asa for Governor. Archived from the original on 8 August 2013. Retrieved 8 August 2013. ^ "Candidates who filed for office in Arkansas". sfgate.com. March 3, 2014. Retrieved March 5, 2014. ^ "Election 2014: Libertarian Frank Gilbert Announces Bid For Arkansas Governor". Southwest Times Record. October 17, 2013. Retrieved October 21, 2013. ^ "2014 Governor Race Ratings for November 3, 2014". The Cook Political Report. Retrieved September 4, 2018. ^ "The Crystal Ball's Final 2014 Picks". Sabato's Crystal Ball. Retrieved September 4, 2018. ^ "2014 Gubernatorial Ratings". Senate Ratings. The Rothenberg Political Report. Retrieved September 4, 2018. ^ "2014 Elections Map - 2014 Governors Races". Real Clear Politics. Retrieved September 4, 2018. ^ "November 4, 2014 General election and nonpartisan runoff election Official results". Arkansas Secretary of State. Retrieved November 23, 2014.